Elizabeth Russis, freshman, and her teammates share a hug after a successful competition. 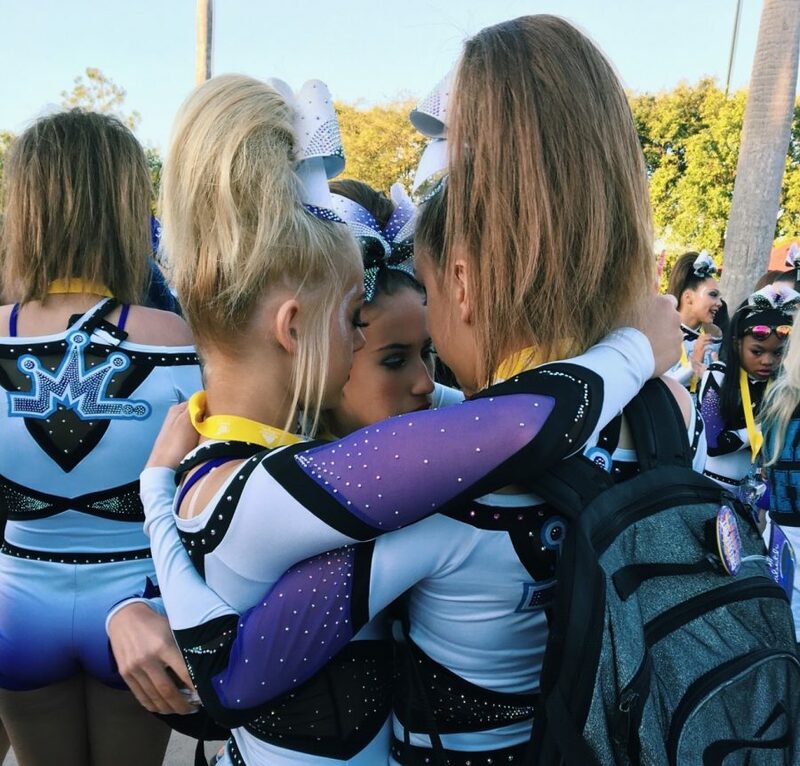 Teammates can offer different experiences as well, dynamics between girls on compeitive and highschool cheer can offer different experiences for cheerleaders. Screams from the crowd push a cheerleader on to continue to push through the routine, hit one more stunt, and finish with a smile. The loud music and screaming from your teammates drones out the nerves and gives the cheerleader confidence to say ‘I can do this’. The music and crowd are big factors in the performance of a cheerleader, but with the varying intensity of competitive (which is also known as “Allstar”) and high school cheer, the experience of the different competition floors can mean a lot, according to Paige Kuklinski, senior and Varsity cheerleader. “High school competitions, their just in a gym and on bleachers, there’s nothing crazy. I mean obviously it’s still nerve racking. But Allstar cheer, when I went to worlds there were 8,000 people watching me in an area, where it was pitch black except for the light that was on the stage that was just you. It’s so completely different and there are so many more people. [Plus Worlds] was filmed, and it’ll be on ESPN so that’s just another added factor that makes you more nervous, so I’ll definitely say that Allstar has a way bigger stage than high school does. Except for State where we are in the area with all the lights too.” Kuklinski said. “I think the stage is a lot nicer because it’s spring floor and it’s easier in your ankles. I feel like it’s more quiet in high school cheer, because I’ve been to one of the competitions, it’s quieter. 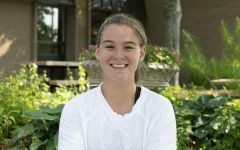 But I feel like in allstar there’s a lot of energy because people are screaming and stuff, so you feed off the energy,” Elizabeth Russis, freshman and Allstar cheerleader, said. Worlds, which is an event brings together more than 11,000 cheer and 4,000 dance athletes to compete for world champion titles in senior and international club divisions and categories, according to United States All Star Federation, can greatly affect a cheerleaders cheer experience, according to Kuklinski. “I think you gain different experiences, I think from Allstar [I] got just a little bit more just because I got to go to worlds and I saw teams from like Finland and Sweden. Like I had team Brazil in the front of me and team Australia in the back of me. That’s something you don’t normally get to experience on a daily basis. But it’s also cool in Illinois cheer because these people basically, not always but, grew up relatively the same as you. So you’re competing against somebody that is 15 minutes away from you rather than across the country so you kinda know what’s going on and what they’re doing,” Kuklinski said. The only way to experience these differences is by doing both competitive and high school cheer, according to Kuklinski who has been doing cheerleading “out of the womb”. However, there are rules restricting a cheerleader from doing both Allstar and high school at the same time, according to Rachael Fischer, head varsity coach. “Full season teams, you can’t compete on a full season [competitive cheer ] team while you are on a high school team, the IHSA has rules against it. So we have girls that do quarter season teams. I see a lot of improvements in them. When my assistant coach and I went and watched the competition in March which was only a few weeks after the competitive season ended for high school. 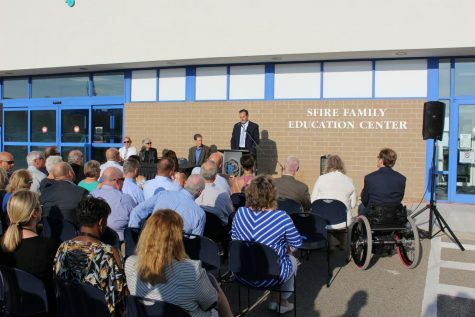 We could already see improvements in our athletes,” Fisher said. These “quarter season” teams are programs offered to athletes after the high school competitive season is over, according to Barrington ICE cheer. 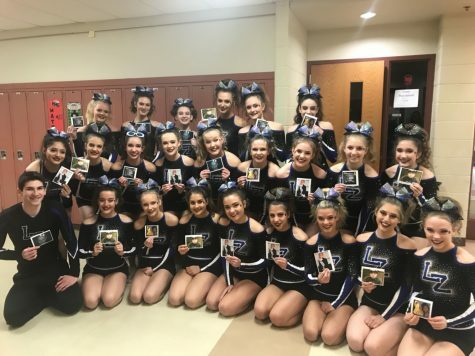 These “post season” teams bring together athletes from all different high schools and the experience of cheering with people you’d normally compete against can be a little “weird,” according to Kuklinski. “At first it was kinda weird, especially since I’m a very competitive person at nature. Like there is this one girl, Hope, from Joliet West, and they won [state in the large varsity division]. So I was like, ‘ugh, like I’m so mad, I wish I could be that girl’, because I wish we won. But the more you get to know them, the more you don’t look at them as competitors because you’re on the same team and you look at them as your teammates rather than your competitors after awhile,” Kuklinski said. Experience from both of these programs can be very beneficial to a cheerleader not only in experience but skill wise as well, according to Fischer. Allstar and highschool are unique and different in many ways,but both are very important to the experience of a cheerleader, according to Kuklinski.